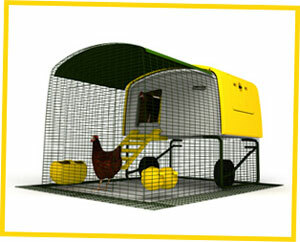 Eglu Cube now in Yellow! Spring has arrived in style at Omlet HQ. The sun has been shining, the wooly jumpers have gone, and the brightest Eglu yet has just landed in our garden. So bright, you might need your sunglasses to see it, the latest Eglu Cube in yellow is sure to put a spring in your step! The Eglu Cube has never been available in this colour before, and we are very eggcited to offer it as a limited edition addition to the range. Whether you already have an Eglu in every colour, of you are thinking of keeping chickens for the first time, why not choose the Daffodil Yellow version to bring the sunshine to your garden every day!? One thing’s for sure – your chickens will never have a problem finding their way home! Order your Yellow Cube today and you could have a flock of hens keeping you hentertained throughout Spring. In fact, you could be collecting your first eggs in time for Easter…That’s far better than a chocolate egg if you ask us! Click here for more information or to order yours today! Now this is a chicken house to yell-ow about! 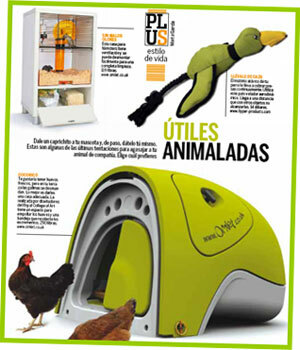 This month we are eggcited to have appeared in Spanish science magazine QUO. 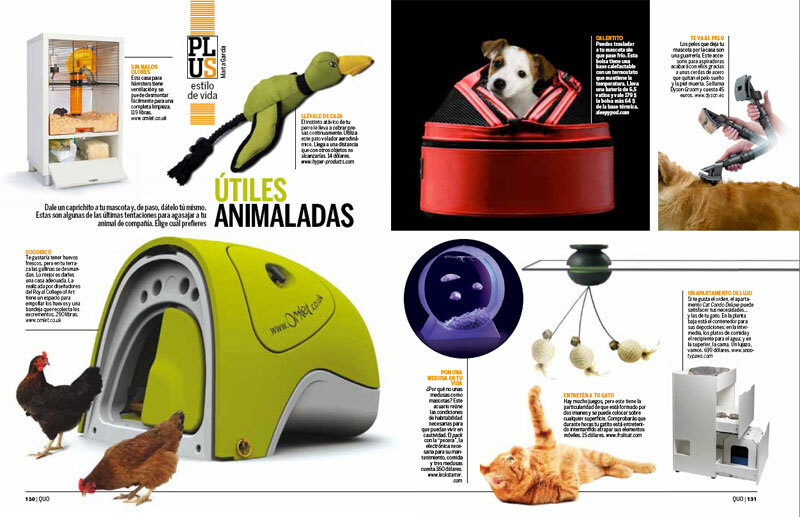 The monthly Spanish-language mag has included a feature on products for pets, showing both the Eglu Classic and Qute, among some other pretty cool gizmos for animals. Although our Spanish isn’t brilliant, we’ve managed to translate their wording using the power of the internet, and it seems to be a glowing report! Marta has concluded that Qute is is an odour-free option for housing hamster, with good ventilation and an easily removable drawer for cleaning. And she thinks the Eglu is a cool hen house with a space for hatching eggs and removable dropping tray, making keeping chickens easy. Fantastico! Too tiny to read? Click above to see the full feature! We all know that bees are clever little creatures, building their comb, doing their waggle dance and producing lovely honey, but scientists have just discovered that there is even more to these amazing insects than we realised. It seems that just like humans, bees have different personalities! Some humans love thrills and adventures and some prefer to play it safe…and it goes for bees too. Researchers have discovered that the bees that go searching for food show novelty-seeking behaviour, and some of their genes match those seen in vertebrates. These honeybee scouts go out to find new sourches of food with no direction, while non-scouts stay safely at home until they are told where to go. When looking at differences between the scouts and non-scouts, researchers found over 1000 differently expressed genes, several of which relate to the chemicals catecholamine, glutamate and gamma-aminobutyric acid. These are known to regulate novelty-seeking and responding to rewards in humans. Still with us? Well, the clever guys decided to try playing with the levels of these chemicals to see if it would have an effect on the bees behaviour…which it did. By increasing the glutamate activity (involved in memory and novelty-seeking in humans) they managed to increase the likelihood of a bee acting as a scout, or making it more of a thrill-seeker. So, we’re not that different after all!